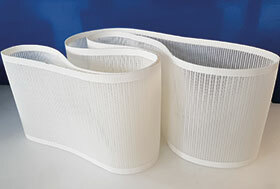 Spiraflex open mesh conveyor belts are manufactured and packaged in Italy. They are specifically designed for the processing and transport of products in demanding manufacturing sectors such as food, hygiene products, insulation, nonwovens, wood processing, biomass fuel and synthetic sheet materials. All of these use Megadyne’s open mesh belts, for at least one of the following processes: washing de-watering, heating, cooling, pressing and forming. SACIF, a recent acquisition of the Megadyne Group, is a leader in fabricating conveyor, open mesh and special timing belts. The width and depth of this special products range is strengthened with the introduction of Spiraflex conveyor belts, made with food contact approved materials and in full compliance with the hygiene rules that regulate food processing and manufacture. Spiraflex conveyor belts are safe and reliable, reducing any risk of product contamination due to Megadyne’s specialised fabrication techniques. They are lighter and have higher performance compared to conveyor belts with a metal mesh. The temperature range is from -30 to 90°C. Manufactured in white PET, they are resistant to high temperatures, non-stick and fully antistatic. The belt edges are sealed to ensure that belt integrity is maintained during operation and through aggressive cleaning regimes. Spiraflex is available in rolls with a production width of 2000 mm and a minimum pulley diameter of 25 mm. Hydraulic and Automation Warehouse (HAW) has expanded its hose crimper offering with the addition of the Uniflex UG32 grease crimper to its range. Rocol Rapid Demulse 220 from leading supplier Bearings Internatonal (BI) is ideal for demanding applications. New to the range of bulk handling systems from BLT World is the contact-free AirScrape conveyor belt skirting system, which significantly reduces material spill, dust formation and explosion hazards at transfer points and other critical sections in the conveyor chain. The Enerteq from Mimic Components is a cost effective power logging meter used for power analysis. Konecranes and Demag has developed a new Double V-Girder crane which is capable of a 50 ton lifting capacity – four times that of the Single Girder. BLT World offers dependable solutions for specific problems at the transfer points of conveyor systems in bulk materials handling on the mines. Nick Boughton, digital lead at systems integrator, Boulting Technology explains how plants with legacy equipment can retrospectively upgrade their facility to a smart factory.